Live Creating Yourself. : This one goes out to all you high-rise dwellers. This one goes out to all you high-rise dwellers. For the record, your rented, architecturally-deprived home has just as much potential to be beautiful as the vintage walk-up with crown moldings, exposed brick, and a fireplace. So no. more. excuses. Put your game face on and start taking notes. 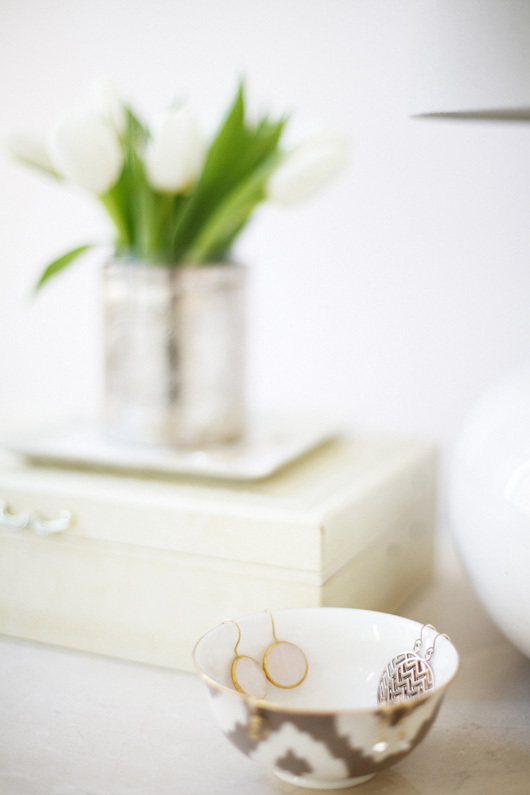 We refer to the home of Jess Constable, author of Makeunder My Life, founder of Jess LC Jewelry, and my lovely friend. 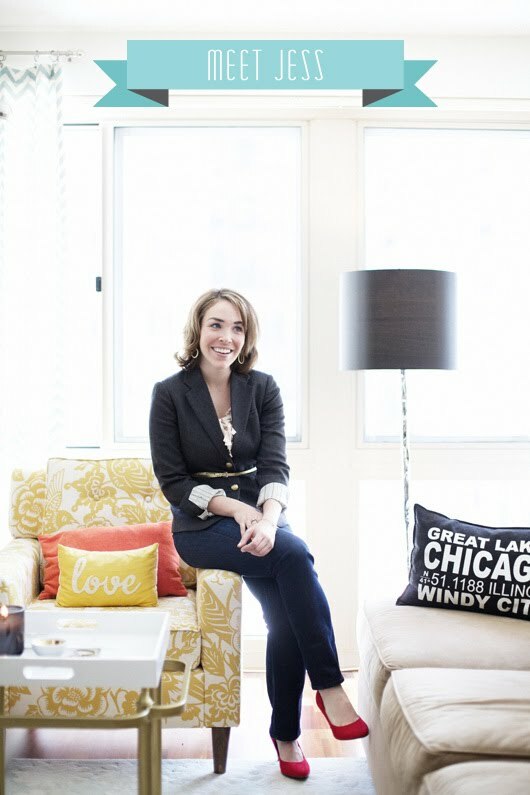 She recently transformed her all-white, one-bedroom Chicago apartment into a colorful haven, worthy of design magazine glory (p. 46). Also for the record, I'd like to add that every woman ought to have a pair of red pumps in her closet. But I digress. Back to the apartment. Jess runs her business from home so she arranged the furniture into two sections, creating both a work space and a living space. 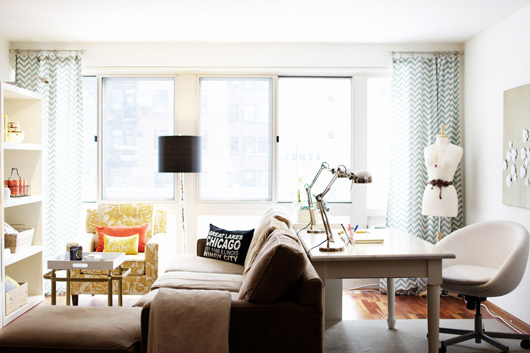 Notice that aside from the yellow accent chair, her key furniture pieces are neutral colors. This is always a smart choice, especially for those of you starting out on your own, seeing as these items can easily transition as your taste evolves. 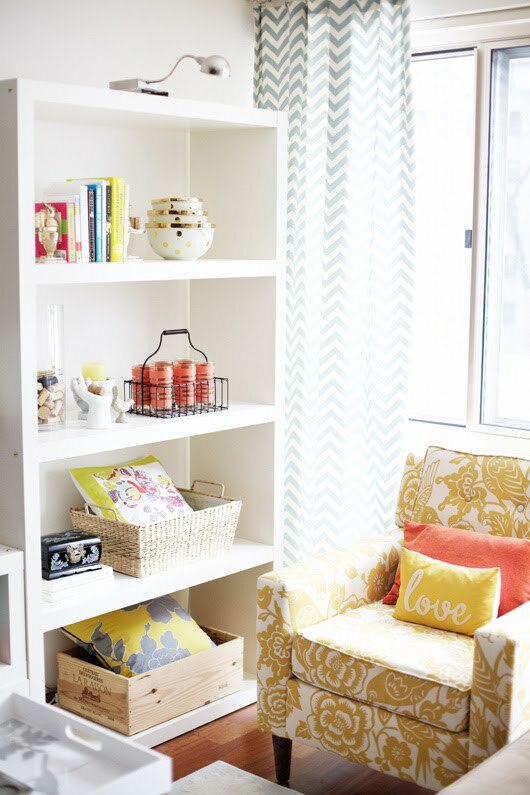 You'll see that Jess relied on decorative accents like curtains, throw pillows, and books to brighten the space. Her furnishings are a combination of retail store favorites mixed with vintage accessories that she's picked up at local flea markets and thrift stores. The yellow chair is from Target, the shelves are Ikea, and the chevron curtains were a custom order made by Etsy seller, Plush Studio. See that desk? That is a slab of polished carrera marble on a white, wooden base. Jess found it somewhere... I forget where... for $120. I hate her for it. I mean, come on. You can barely buy a desk from Ikea for that price. And we all know how I feel about carrera marble. ...as well as the floral painting above her headboard. Jess found the night stand on a curb and gave it a fresh coat of white paint. Ahhh yes. A girl after my own heart. I'm telling ya, it pays being crafty. The headboard, duvet cover, and lamps are all from my personal favorite, West Elm. Another virtual high five to Miss J. Love this soft color palette. 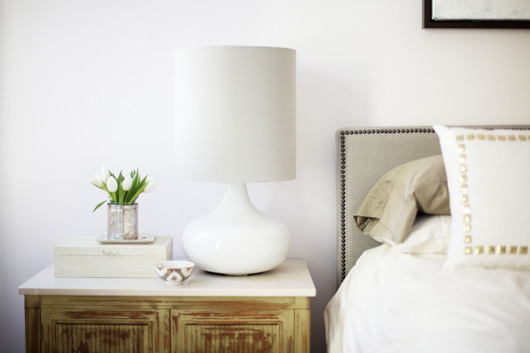 Various shades of ivory, distressed wood, and fresh tulips readily translate into sleepy time bliss. Further proof of Jess' limitless talent is Jess LC, her ever-expanding jewelry line. All named after Chicago streets, the various collections range from sterling silver earrings, and colorfully beaded necklaces, to braille-engraved pendants. Prices range from $20 to above $100, so keep them in mind for Valentine's Day! And a warm-fuzzy congratulations goes to my friend, Jess. Bravo, and thank for your inspiring! And many compliments to the talented photographer, Emily Johnston Anderson, another lovely friend who you may remember from a post I did back in November. Girl's got skillz. With a z.
I love, love her space! I am a big believer in creating your own art, so I loved hearing that she made the art herself! 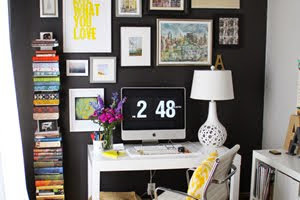 It's a great way to save money and add color to a space. What a total knock-out space this is! Thanks for sharing, A! 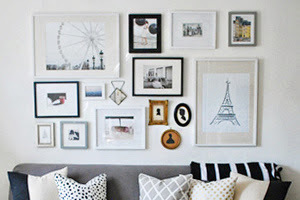 I love the floral DIY art she has- beautiful! Love it. I must have the Great Lakes pillow. Any info on that? So gorgeous! Did those ring pulls come with the nightstand? If not, where, oh where, did she find them? I absolutely love this look!! I'd love to know also where she got that adorable black Chicago pillow! Did you see that Jess LC has a deal on Eversave today!?! I am so excited!